A plethora of races were run as one in Gettysburg on Wednesday with the staging of the Central South Dakota Conference Meet, the Yellowstone Trail Conference Meet and a combined race that included Lyman, the only team not in either of the conferences. Four Mobridge-Pollock runners had top 20 finishes in the CSDC race. Abby Keller led the Tigers with a ninth-place finish, crossing the finish line in 22 minutes, 20.27 seconds. Gretchen Olson took 17th, coming in at 24:15.92. Blaise Thompson led the boys with a 13th-place finish. He ran 20:09.9. Kamron Pearman came in 16 seconds later, finishing at 20:25.76 and taking 16th. 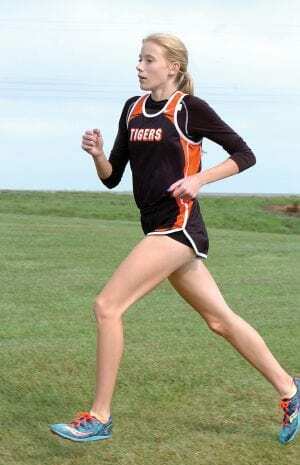 Emma Fulkerson and Chad Good Shield rounded out the Tiger teams. Fulkerson ran 26.23.06 for 22nd, while Good Shield ran 22:04.63 for 27th. Christopher Hass of Sunshine Bible Academy won the boys’ division and Gracie Weinheimer won the girls’ division. Miller and Sully Buttes won team titles. Rhaecine Sam of Wakpala ran 17:07.61 to win the YTC title and the open race. Devon Archambault of McLaughlin 20:36.61 to win both girls’ titles. The McLaughlin boys and Sully Buttes girls won both team titles. The Tigers and Lady Tigers compete for the chance to run at state at the Region 4A Cross Country Meet in Chamberlain on Thursday. Team Scores: Miller 15, Faulkton Area 24, Sully Buttes 29, Potter County 49, Wolsey-Wessington 49, Sunshine Bible Academy 52, Mobridge-Pollock 54, Highmore-Harrold 72. 21. Blake Farstveet, Highmore-Harrold, 21:04.29; 22. Everett Paul, Sunshine Bible Academy, 21:04.51; 23. Remington Paynter, Highmore-Harrold, 21:18.26; 24. Jonathon Wheeler, Potter County, 21:18.45; 25. Eli Fanning, Miller, 21:42.86; 26. Kaden Sivertsen, Miller, 21:44.97; 27. Chad Good Shield, Mobridge-Pollock, 22:04.63; 28. Lincoln Jordre, Sully Buttes, 22:05.67; 29. Payton Lucas, Wolsey-Wessington, 22:34.96; 30. Barry Johnson, Highmore-Harrold, 23:17.82; 31. Luke Naber, Miller, 23:31.85; 32. Sam Pederson, Sunshine Bible Academy, 24:46.78; 33. Gage Davis, Sunshine Bible Academy, 25:49.96. Team Scores: Sully Buttes 6, Potter County 18, Miller 35, Wolsey-Wessington 38, Mobridge-Pollock 41. Individual Results: 1. Gracie Weinheimer, Sully Buttes, 20:50.83; 2. Dani Frost, Sully Buttes, 21:05.03; 3. Calleigh Chicoine, Sully Buttes, 21.11.75; 4. Oakley Jandreau, Highmore-Harrold, 21:42.07; 5. Shiara Noyes, Wolsey-Wessington, 21:51.59; 6. Emilie Larson, Potter County, 21:58.88; 7. Kimberly Hageman, Potter County, 22:00.18; 8. Tori Crook, Potter County, 22:05.92; 9. Abby Keller, Mobridge-Pollock, 22:20.27; 10. Delanie Larson, Potter County, 22:23.72. 11. Abby Ketelhut, Miller, 22:34.8; 12. Allyson Wittler, Sully Buttes, 22:39.1; 13. Sydney Jessen, Miller, 23:01.79; 14. Maddie Knox, Highmore-Harrold, 23:19.69; 15. Renee Seaman, Sunshine Bible Academy, 23:22.08; 16. Sara Jessen, Miller, 24:02.46; 17. Gretchen Olson, Mobridge-Pollock, 24:15.92; 18. Brooke Sargent, Miller, 24:43.72; 19. Summer Ludemann, Wolsey-Wessington, 25:56.68; 20. Gabi Naber, Miller, 25:59.35; 21. Jordyn Cutshaw, Wolsey-Wessington, 26:06.96; 22. Emma Fulkerson, Mobridge-Pollock, 26:23.06; 23. Hannah VanHuevelen, Sunshine Bible Academy, 33:07.77. Team Scores: McLaughlin 6, Sully Buttes 20, Herreid/Selby Area 25, Potter County 30. 11. Pier LiPizzi, Herreid/Selby Area, 20:36.72; 12. Austin Faw, Edmunds Central, 20:43.39; 13. Quinn Jordre, Sully Buttes, 20:52.87; 14. Trevor Beyers, Edmunds Central, 20:56.53; 15. Koltyn Forbes, Potter County, 20:58.38; 16. John Hamre, Herreid/Selby Area, 21:10.23; 17. Jonathon Wheeler, Potter County, 21:18.45; 18. Eli Hamre, Herreid/Selby Area, 21:37.31; 19. Lincoln Jordre, Sully Buttes, 22:05.67; 20. Richard Seibel, Herreid/Selby Area, 26:08.34; 21. Paul Massingill, Herreid/Selby Area, 36:39.54. Team Scores: Sully Buttes 6, Potter County 15. Individual Results: 1. Devon Archambault, McLaughlin, 20:36.61; 2. Gracie Weinheimer, Sully Buttes, 20:50.83; 3. Dani Frost, Sully Buttes, 21;05.03; 4. Caileigh Chicoine, Sully Buttes, 21:11.75; 5. Emilie Larson, Potter County, 21:58.88; 6. Kimberly Hageman, Potter County, 22:00.18; 7. Tori Crook, Potter County, 22:05.92; 8. Delanie Larson, Potter County, 22:23.72; 9. Allyson Wittler, Sully Buttes, 22:49.1; 10. Carissa Schwingler, Eureka/Bowdle, 26:05.23; 11. Frankie Jamerson, McLaughlin, 29:46.22; 12. Savanah Wolff, Eureka/Bowdle, 34:34.22. Team Scores: McLaughlin 14, Miller 29, Lyman 30, Faulkton Area 40, Sully Buttes 52, Herreid/Selby Area 66, Sunshine Bible Academy 74, Potter County 76, Wolsey-Wessington 78, Mobridge-Pollock 84, Highmore-Harrold 105. 51. Cody Uthe, Lyman, 22:37.86; 52. Rayden Rodruguez, Lyman, 23:09.21; 53. Barry Johnson, Highmore-Harrold, 23:17.82; 54. Luke Naber, Miller, 23:31.85; 55. Sam Pederson, Sunshine Bible Academy, 24:46.78; 56. Gage Davis, Sunshine Bible Academy, 25:49.96; 57. Richard Seibel, Herreid/Selby Area, 26:08.34; 58. Paul Massingill, Herreid/Selby Area, 36.39.54. 21. Madison Brown, Lyman, 25:33.36; 22. Summer Ludemann, Wolsey-Wessington, 25:56.68; 23. Gabi Naber, Miller, 25:59.35; 24. Carissa Schwingler, Eureka/Bowdle, 26:05.23; 25. Jordyn Cutshaw, Wolsey-Wessington, 26;06.96; 26. Emma Fulkerson, Mobridge-Pollock, 26:23.06; 27. Frankie Jamerson, McLaughlin, 29:46.33; 28. Hannah VanHeuvelen, Sunshine Bible Academy, 33:07.77; 29. Savanah Wolff, Eureka/Bowdle, 34:34.22.